Above: Walt and Carol Fredericks tell their story about how they had Pool Man finish their inground pool installation after another pool company left them "high and dry". Above: Testimonial from Michael Burch of Floyds Knobs, IN. Pool Man installed a Double Roman Liner pool for the Burch family in 2013. This enthusiastic customer describes his experience of the pool installation process. Above: Testimonial from Beth Smith of Crestwood, KY. We installed a fiberglass pool for her family in 2012. Once we started digging we began to hit rock. The process took a bit longer than expected but that didn't stop the Pool Man from building them a fabulous pool! Above: We were able to meet up with one of our customers, Rodney Underwood, whom we installed a liner pool for in 2011. From the initial signing to the last payment it was a 3 month process. The actual installation took only 14 days! Above: We got to visit with another wonderful customer who has had not one, not two, but three pools from us! Tim Nash tells us what he thinks of our services that we have provided for him. Above: Testimonial with Mark Keller regarding the second pool he purchased from Pool Man. This beautiful, tiled pool was installed by Pool Man in 2011. Above: Interview with Chris Hancock who purchased a liner pool from Pool Man in September 2009. We are happy to continue doing business with him. Providing service after the sale is very important to Pool Man! I just wanted to drop this note to let you know what a great job your staff and you have done for Bellewood Condos and me personally. Starting with our complete renovation a few years ago up to the present day your installation and service are TOPS. We, here at Bellewood, couldn't be happier with all aspects of your business service. You have helped us out of many jams with smiles on your faces when I knew you guys were probably too busy to be so helpful. We greatly appreciate your whole staff and particularly you two guys. I always say that attitude comes from the top and it is sure true of your organization. My Wife, Daughter and I were transferred to the area for my job in early 2008. Since this was our 6th move in 8 years, it was just a bit stressful to say the least. We had never owned a pool before but it seemed like a great way to meet people in the neighborhood and I also did promise “bribe” my daughter Emily with a pool for putting her thru another move. At the beginning of interviewing Pool Companies, I quickly learned how bad the economy really was and going with a very reputable company gave me great piece of mine. The Pool Man also gave me the best deal but more importantly the quality and service that went along with the GREAT DEAL was definitely worth it. Swimming Pools are not cheap and a big investment financially and emotionally. The risk of working with just your run of the mill installer elevated my risk immensely in so many ways and that was one of the biggest reasons why I went with The Pool Man. The piece of mind that I got from working with the best craftsmen in the business was a huge relief. They actually helped you design your backyard oasis instead of just showing you a book of different designs. My pool truly became a one of a kind. Mike met my wife and me at the house and not only helped decide where to locate the pool and what size we should get, but even helped us blend it into our deck and gave us the insight of many lessons learned by other people. He helped us determine what infrastructure to put in even if we were not ready for that portion of the job yet. He showed us where we should bury conduit around the pool area “JUST IN CASE “we wanted extra lights, or stereo speakers, whatever the case may be. They even own their own heavy equipment of which to complete a pool eliminated the risk of seeing my hard earned savings disappear or be used to finance someone else’s pool project. The care that went into each process by the incredible staff left me enthusiastic to refer as many friends and family as possible to The Pool Man. The footprint all the workers and machinery left in my yard was so minimal, the daily clean up was extremely considerate; everyone I met was kind and polite and did exactly what they said they were going to do. Should you ever need me to brag to one of your clients in person, it would be my pleasure. The kind of service and quality that I received from The Pool Man was exactly what you could hope for. The best part of the experience was when the pool was done, Lisa actual came to my home and walked my wife and I thru all of the systems and showed us how to properly care for the pool. She has a very knowledgeable staff at the store where we go about every 2 weeks during the season to have water tested (I have not mastered that part yet). And they ONLY sell you the specific amount of chemicals you need and nothing more. No huge bills when we go there unless I bring my daughter who may want a huge lounge chair. Thanks again Mike & Lisa for all your help with our backyard oasis, we are customers for Life. We just wanted to take a moment to say how thrilled we have been with our pool. You worked so compatibly alongside our builder when we were putting the pool in. Being first time pool owners, you all have been so patient with us--teaching us over and over how to handle the chemicals and test our pool. Mike's dad practically lived with us one weekend after we had messed things up!!!! We thank you for always being prompt with service and for going out of your way to delivery chemicals if needed. When we were looking for a hot tub, we tried to make sure we were getting the best deal on a great product and searched all around but nobody even came close to the price and quality of the hot tub we got from Pool Man. The guys who come out to do service are so professional and we have always been more than satisfied with anyone who has come out to the house or who we have dealt with in the store. We love Pool Man and have and will continue to recommend you all to anyone we know!!!! I just wanted to thank Pool Man for a wonderful experience purchasing an in- ground pool. I purchased the pool about two years ago. I interviewed several local companies and Pool Man stood head and shoulders above the rest in professionalism, service, and the entire process. One particular event continues to stand out, during the site preparation, Mike Kane informed me I would need a pump installed under the pool so ground water would not affect the pool once installed. He was the only one that took the time to explain this process and reasoning, which could have saved me thousands with all the rain. After two years, the service is still fantastic. I have recommended your services to many friend s and co-workers and all of them had the same experience and positive feedback. Thanks for all you have done and the wonderful experience we had. We utilize our pool all the time and it is nice to know we don’t have to worry about any problems. By the way the salt system was the best purchase to date. Thank you guys again and look forward to many years of “My Pool”. When my wife and I decided to invest in a pool in the winter of 2010, we looked around at a lot of different vendors. Out of all the vendors we met with, big and small, no one came over as honest and competent as Mike and Lisa at The Pool Man. When we explained our needs, they showed us the options that were available and some ideas that we hadn’t even thought of yet. Even more impressive was the advice that they readily gave to us, regardless of whether we decided to purchase from them. After weighing all of the options, we chose to purchase from The Pool Man, and have not regretted it for one minute. From the first time Mike came over to the house to do some early measurements, he was great to work with. Many little details that my wife and I never would have thought about were second nature to him. Everything from explaining how the easement in our lot worked, to thinking about running additional electrical circuits, Mike was thinking and asking us how we would want it done. Once they broke ground, Mike was at the house almost every day of the week making sure his crew got it right even though we were almost an hour drive from the shop in Southern Indiana. The guys at The Pool Man were excellent to work with. They did an excellent job of making sure we, as customers, were accommodated in everything we could want. They also keep a clean and safe job site and are thoroughly professional. Mike and Lisa also have excellent contacts with contractors for concrete and plumbing. The concrete job done by Jason Weddle and his crew was absolutely top notch. Everything about this process, from picking out the color of the pool, to looking at a draining problem that existed before they even started working was great. The Pool Man was an excellent company to do business with. You knew they were always looking to deliver the best product and look out for their customers’ needs. I have recommended them to several of my neighbors and would not hesitate to recommend them to anyone else. If you are looking to build a new pool – you definitely want to talk to The Pool Man. When I was as small child we had an in ground pool with a diving board and slide. For many years in my adult life I dreamed of having that again. When the time finally came that we could put in a pool we looked at several companies then chose Lisa and Mike (Pool Man) to do the job for us. Now almost 5 years later we continue to believe that was a wise decision. I had an idea of what kind of pool we wanted but was initially overwhelmed and confused by the choices that needed to be made. Lisa and Mike guided us through the process, made the options clear, and were very patient with our numerous questions. They helped us make the right decisions that transformed our plain back yard into our own slice of paradise. Our pool is now the activity hub for our family and friends in the summer. We spend most of our free time in our back yard. The automatic pool cover we chose has given us peace of mind that the kids are safe when the pool is “closed”. It also helps keep the pool clean and uses less chlorine. We are so glad we took their advice and went with the salt water system – so easy! We recently expanded the concrete patio to add a basketball court. We used the same concrete sub-contractor that did the original concrete around the pool as they did an excellent job. We continue to see the Pool Man crew as we always have them open the pool in the spring and close / winterize the pool in the fall. They always respond promptly and professionally to any maintenance needs that come up. The Pool Man continues take care of our expectations and needs. All of my life I have wanted an inground pool. My wish came true in the summer of 2008. We delayed the process because it was so overwhelming to think about what we might want and what we could afford, but in January 2008, we started talking to Mike and Lisa with The Pool Man. They came to our home to help us make plans and explained everything to our satisfaction. They helped us choose the shape of pool for our yard; we bought a salt pool, and we even went with the Cozy Cove, which proved to be a great choice. Even though it was a rainy spring, they made sure the pool installation was done properly. Mike stayed in touch with us regularly to discuss the weather and what our next steps would be. Nothing that is worth having ever goes smoothly, and there were a few bumps in the road, but Mike and Lisa kept reassuring us that it would all work out. They were right! We have the most amazing pool and surrounding area. It is easy for companies to make big promises, but the one I want is a company that stays in touch, stays professional, and is there for us throughout. Even now, we know that they are there for us when we have questions. That is a pool man that you want to have, and now I have my beautiful area of serenity in my backyard – dream come true. It is hard to believe that it has been five years since you, Michael and team installed my pool. I wanted to take a quick moment to thank you and your team for an enriching experience in owning a pool and hot tub. We have created many family and friends memories in casual outings at our pool and the more formal pool parties. The pool is definitely the outside hub of activity throughout the late spring and the late fall. As you are probably aware we also love to camp and go boating during the summer but it is nice to know we do not have to give up the water on the times we are at home. And especially looking forward to this summer, as the gas prices go higher we will be enjoying our pool and hot tub more so. It is also good to know how responsive you and your team are when we do have issues with our equipment and especially when I call right before one of our planned pool outings with an issue and you rise to the challenge. You have proven yourselves time after time to respond and fix our issues. Also, the times we have had a blip in service; it's not that we had a blip in service but how you respond quickly and resolve the issue. Thank you again Lisa. We are looking forward to many more "five year" periods with you and The Pool Man. We had our pool installed in 2006 by Mike and Lisa from the Pool Man. We had several bids and no company could compete with the price and service that the Pool Man provided. They suggested doing a salt pool with a heater. As you can see in the picture having the heater allows us to add several months to our swimming enjoyment. Having the salt water reduces maintaining the pool to almost nothing. The thing I am most impressed by is the customer service after the sale. Lisa and Mike have now become friends of ours and are always there when we need help. Thanks for being such a great company and also friends. I've been meaning to write this for quite some time but, as with many things, it has fallen to the side. 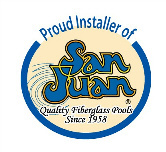 I want to thank everyone at The Pool Man for the excellent service you have provided during the install and also our learning how to take care of a pool. One of the reasons we chose The Pool Man was the fact that we were able to deal directly with the owners. Even though we have had our pool two years, that has not changed. You stand behind your products and aren't just interested in moving on to the next install where you can make more $$$! Anyone that has ever owned a pool knows that issue are going to arise. Each time we have had a problem, both yourself and Mike have been extremely helpful. There is a tremendous level of comfort in having both of your personal cell numbers and knowing you will answer them 24/7. Thanks aging for all your help. We are looking forward to many years of enjoyment out of our pool and would highly recommend The Pool Man to anyone in the market for a pool. Once again it is time to open the pool. I would like to take this opportunity to say “Thank You” to you and your staff for your assistance and professionalism. From the planning stage to the building of the pool and maintenance, The Pool Man has been an experienced partner helping me maintain my pool and Jacuzzi. Your staff has always been very friendly and knowledgeable whenever I have had any questions. I look forward to another fun filled season at the pool knowing I can look to you for all my pool needs. We had our pool installed by The Pool Man in 2008. It was a great experience. We LOVE our pool and could not have picked better people to work with! When our pool was being put in, the employees of The Pool Man were always on time and so polite and friendly. If there was ever a delay, they were sure to give us a call and tell us. That is rare in any business these days! We have NEVER had a problem with our pool since it was put in. They were very responsive to all of our questions then and are still that way today. I would recommend The Pool Man very highly and cannot say enough nice things about them! Our pool is wonderful and we get MANY hours of enjoyment out of it. Lynda Hines...Stone Lakes subdivision...J-town, KY.